Let Chinese Calligraphy and Painting Classes Enrich Your Life- Ms. Huang will lead you to discover the beauty of Chinese Art. Please call 336-5069 for reservation. $ 25 per hour. 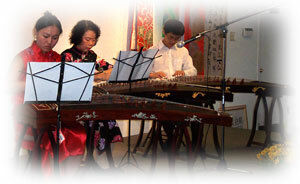 Guzheng is the representative Chinese music instrument with a history of more than 2500 years. We are honored to invite Ms. Shao Jingqun, one of the top-class Guzheng virtuosos in China, to teach Guzheng at our center. Either for enriching your life or training your children to be more creative and gracious with this traditional beautiful Chinese music, this is a good chance. Classes are available for Mondays and Saturdays. Every Saturday 10:30 am - 12:00 pm, admission is free. Please call 336-5069 for reservation.